"Big Pink" was a pink house in Woodstock, New York, where the Band – Bob Dylan's '65-'66 backup band on tour – moved to be near Dylan after his motorcycle accident. While he recuperated, the Band backed him on the demos later known as The Basement Tapes [see No. 292] and made their own debut. Dylan offered to play on the album; the Band said no thanks. "We didn't want to just ride his shirttail," drummer Levon Helm said. Dylan contributed "I Shall Be Released" and co-wrote two other tunes. But it was the rustic beauty of the Band's music and the drama of their own reflections on family and obligations, on songs such as "The Weight," that made Big Pink an instant homespun classic. Music From Big Pink went from album to legend decades before it reached its 50th anniversary this year, an occasion being celebrated with the release of a variety of splashy commemorative reissues, all featuring a startling new remix by Bob Clearmountain. Such a milestone offers an opportunity for a reassessment, but the striking thing about the Band’s debut album is how its story hasn’t been changed since its release in the summer of 1968, when it provided a tonic to the overblown psychedelia swamping the late 1960s. This narrative didn’t just come out of the blue. Journalist Al Aronowitz wrote three lovely portraits of the Band in 1968—appearing in Life, Rolling Stone, and Hullabaloo, covering every possible readership—that made hay of the many years the Band spent grinding out a living on the road. He treated Big Pink, the house the group shared with Bob Dylan in West Saugerties, New York, with a nearly mystical reverence. This framing persists to this day, buttressed by repetition and hagiographies, all citing elements of these initial stories as accepted fact, possibly because there is considerable supporting evidence that Music From Big Pink had a profound influence on the Band’s peers. At the time, George Harrison and Eric Clapton cited the album as the reason why they decided to abandon overdriven blues and psychedelia to pursue a path of quiet contemplation and authenticity. Authenticity is always a tricky thing regarding the Band. Music From Big Pink is often called the place where Americana starts even though every member, save drummer Levon Helm, hails from Canada. What’s harder to parse is how Music From Big Pink gets conflated with The Basement Tapes, the collection of homemade recordings Dylan cut with the Band during the summer of 1967. Intended as songwriting demos and self-amusement, those recordings wound up circulating as a bootleg for years, headed off by the 1975 release of a double-album which was loaded up with Band tracks not recorded at the Big Pink, giving the impression that the Band were equal players during this time, when the tapes were largely devoted to Dylan. Similarly, the very title of Music From Big Pink suggests that the album itself is a product of The Basement Tapes, which is true as far as its sensibility and many of its songs originate in the music Dylan and the Band made when nobody was listening during 1967. Music From Big Pink, in contrast, was very much made with an audience in mind. Because of their months of woodshedding with Dylan, the Band—who at that point were lacking even their plain Jane name—were a hot commodity within the music industry. They signed a deal with Capitol who put the group into high-end recording studios in Manhattan and Los Angeles with producer John Simon. While they were there, the Band didn’t follow standard procedures: Guitarist Robbie Robertson is fond telling an anecdote where the group insisted on removing studio baffles so they could play face to face. Because of, or perhaps despite all this, they wound up with an album so rich and complex it still sounds singular even on its 50th birthday. From the outset, its originality was described in terms of genre, how Music From Big Pink draws from a number of American roots musics—country, blues, gospel, folk, gospel, rockabilly—without ever sounding distinctly like one its inspirations. Such a hybrid has since become common, yet Music From Big Pink still sounds trapped out of time, lacking the simplicity of its predecessors or the po-faced sincerity of its disciples, and so much of this is due to how the album is executed with a casual disregard to authenticity. Robertson may have advocated for the Band to play as a unit, a savvy move that captures their elastic interplay, but Simon didn’t produce the group as if they were a mere bar band. The very presence of Garth Hudson, an organist who doubled on horns, removed the Band from the confines of three-chord rock’n’roll, with his waves of texture evoking not just gospel but the heady horizons of psychedelia the Band reportedly rejected. While it’s true that the 11 individual songs on Music From Big Pink are steeped in tradition, the album itself is resolutely modern, a studio concoction meant to expand the mind. Listen to how the album starts, not with a salvo, but with a dirge. “Tears of Rage” comes into focus with a guitar line phased so heavily it sounds like an organ, the piano chords piling up just as pianist Richard Manuel’s lonely voice begins to pine. It’s well over a minute before another voice is heard, with the song slowly expanding to encompass horns and harmonies, every sound in concert and every musician in communion. The tempo soon quickens with “To Kingdom Come,” where the supporting vocals of Rick Danko and Helm carry the shakey Robertson through to the end, setting the stage for the communal hymn of “The Weight.” Simultaneously the best example of the Band’s collective nature—Helm and Danko switch verses, everybody chimes in on the chorus—“The Weight” also is an outlier on Music From Big Pink, pointing the way to the lean and sinewy sound of their self-titled second album. The rest of the record contains so many textures, it nearly feels ornate: the plaintive “Lonesome Suzie” gains resonance with its washes of echo and horns, while “Chest Fever”—the hardest rocking number here—is a head trip, thanks to the roar of overdriven organ and indecipherable vocals. Music From Big Pink may be rooted in the earth but it exists entirely within the head. The way it makes roots music sound as impressionistic and idiosyncratic as any other kind of rock’n’roll is revolutionary. It casts a very distinct spell, which is why it’s so unsettling that the new Bob Clearmountain mix breaks this moody magic. Clearmountain takes pains to separate the elements that were previously inextricably intertwined, shattering the specific otherworldliness that has been retained in every reissue of the album over the past fifty years. Sometimes, certain parts are pushed to the forefront—the call and response on “We Can Talk” by Helm and Danko are isolated from each other—and sometimes, everything piles on to of each other, as on the cacophonic “This Wheel’s on Fire.” Worse, extraneous studio chatter has been added to “The Weight” and “Lonesome Suzie,” a move that punctures the illusion that Music From Big Pink materialized out of thin air from a cheap rental house in the woods of New York. 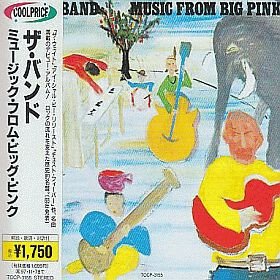 Perhaps this super deluxe reissue accidentally deflates that myth, but the legend of Music From Big Pink is so deeply ingrained in musical culture that one single splashy reissue can’t tarnish its reputation. If anything, this super deluxe edition—complete with a 49-minute album pressed as a double-LP at 45rpm—encourages exploration of the original album, because even with the bright, discordant new remix, there remains a mysterious core that can not be explained but only experienced.